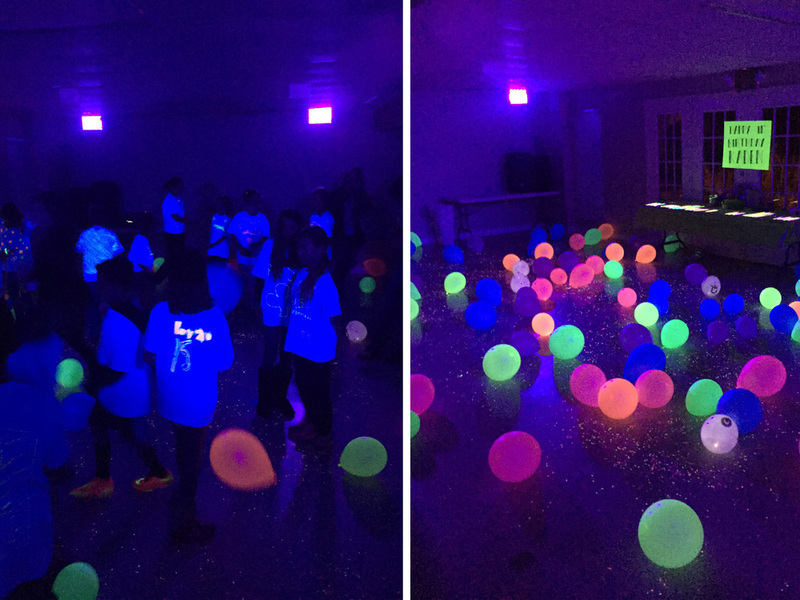 Dad throws awesome glow in the dark birthday party for his son using our rental UV/black lights! "I grabbed some screws and washers & attached each light to a 2 foot long piece of 1"x4" wood. I then removed a ceiling tile and put the light up so that the wood was sitting on top of the ceiling tile cross bars on a slight angle so that it was resting on top of 2 of the cross bars...kind of in the corner of the ceiling tile space. I then laid the tile back in to place resting on top of the wood which applied enough pressure that the fixture didn't really move at all. I then ran extension cords through the ceiling tile space so no wires were exposed for the kids to have an accident with. (I'm a former alarm system installer!) I used black light reactive balloons and reactive confetti that I sprinkled all over the floor for an added effect. In person...it looked amazing from all angles. The room that we rented was about 30' x 16' and the 4 lights were plenty enough. I had borrowed a sound system from a friend and well-ah!! It turned out to be a pretty incredible party that our guests will hopefully never forget!!"